It’s all in the fabric. 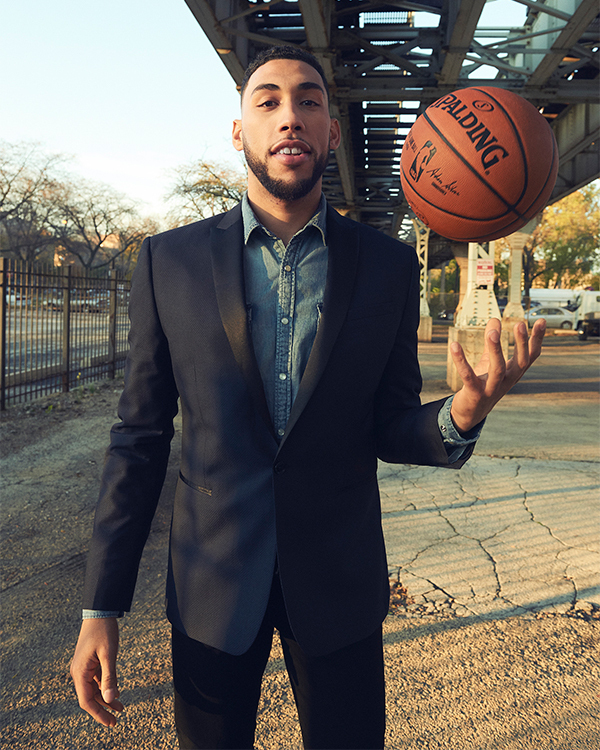 Michigan-born Denzel Valentine might be just one year into his NBA career, but the 24-year-old shooting guard is already carving out a reputation in the league for being a versatile player with strong leadership instincts. Valentine’s natural talent and commitment to his craft are what make him one of our 2017 NBA Game Changers. 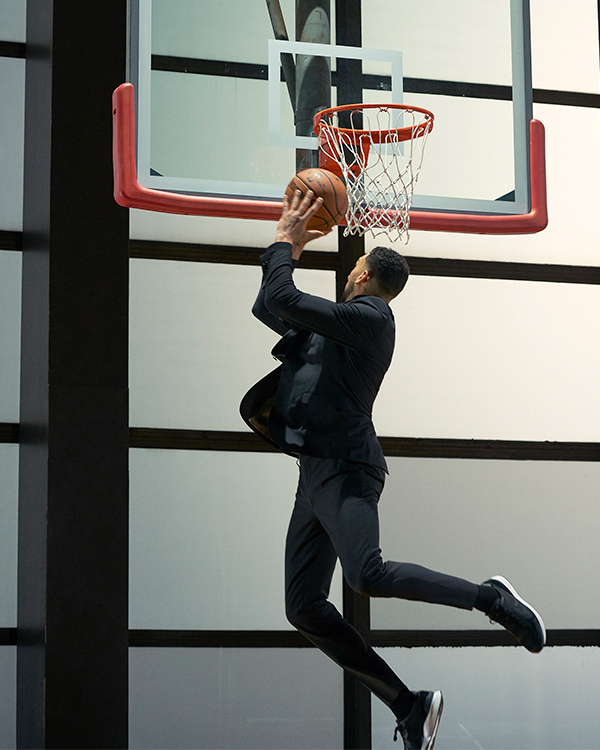 Of course, it doesn’t hurt that the 6’6” athlete also happens to look great in a suit—and feels as comfortable in tailoring as he does in a pair of sweats. Between games and Express fittings, we caught up the rising star to talk about suit styling, his newfound appreciation for turtlenecks, and more. 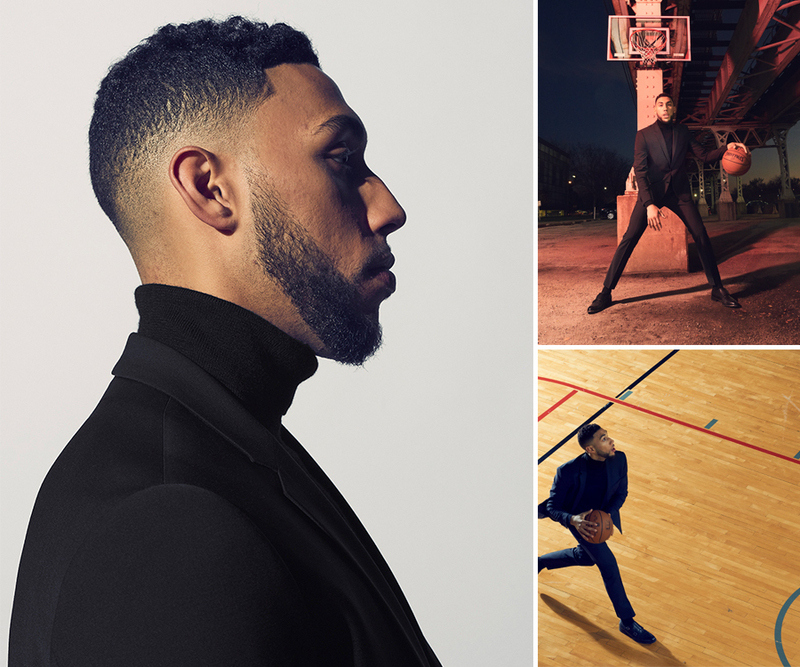 Get to know this basketball and style legend in the making, below. 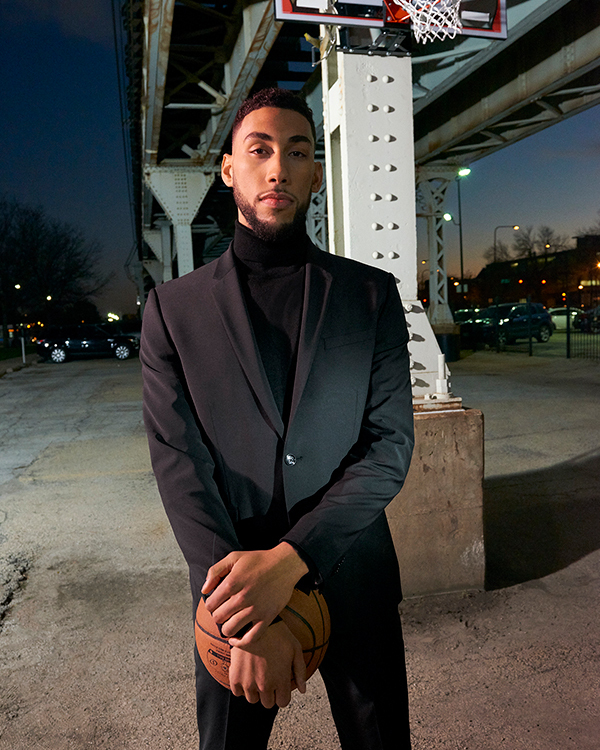 Denzel Valentine: My personal style is comfortable and simple. During the season we’re traveling a lot, so I tend to wear sweat suits. That said, I do like to dress up when I can. I like a suit. Mostly, I just look for nice pieces that are still comfortable. I think as professional athletes we’re on a platform, maybe now more than ever thanks to social media and brands like Express, who shine a spotlight on our style and our personalities. You can really put yourself out there as more than just a basketball player now, which is really cool. Do you think dressing up helps you get into the competitive spirit at all? Yeah, totally. When you’re walking into the gym and you look good, it kind of makes you feel like you’re going play well too. You don’t want to be the guy that looks good and plays terrible, so it helps you get into that winning mindset. Like you can’t let yourself down. What Express look or specific piece did you like the best from your shoots with us? The black turtleneck, which I wore with a black sports jacket and a pair of black jeans, was surprisingly one of my favorite things. I felt comfortable and I liked that it was something a bit different than a classic black suit with a white shirt. I thought it looked pretty cool. I don’t really wear turtlenecks in my normal life so it was big time. How does a young guy wear a suit and still look young? Is that combination the trick? I think it’s all about not being too classic with the styling. Wearing a denim shirt or turtleneck or even a dress shirt with a bow-tie under a suit just brings the look to another place and keeps it from looking just ordinary. Are you into sneakers with a suit? Yeah, it’s cool. It’s got to be the right sneakers and the right suit though. Like, Express suits are cut slim and are kind of stretchy so they feel normal with sneakers. You can’t just wear any business suit off the rack with a pair of tennis shoes. You’ll feel all uptight on top and then comfortable on your feet, which just isn’t right. I’ve worn my Express suits with Nikes and Jordans but you could wear them with any nice shoes really because they’re made for that. What will you be wearing to holiday parties and family gatherings this year? Any parting words of wisdom for guys out there who want to look as cool as you do in their suits and such? I think I would just say don’t be ashamed follow somebody whose style you admire and kind of like steal their look. I do that all the time. Maybe I’ll see an actor or a football player or someone who wears something that I like and I’ll steal it, but put my personal twist on it. That’s the good thing about social media. You can get ideas and figure out how you want to present yourself to the world.